In large bowl, beat cupcake ingredients with electric mixer on low speed 30 seconds, then on medium speed 2 minutes, scraping bowl occasionally. Divide batter evenly among muffin cups. Bake 18 to 23 minutes or until tops spring back when lightly touched. Cool in pans 10 minutes; carefully remove from pans to cooling rack. Cool completely, about 30 minutes. To decorate cupcakes, poke 1 pretzel piece into each cupcake for stem. Cut each gumdrop leaf into 3 slices. Poke 2 gumdrop leaves into top of each cupcake on either side of pretzel stem. 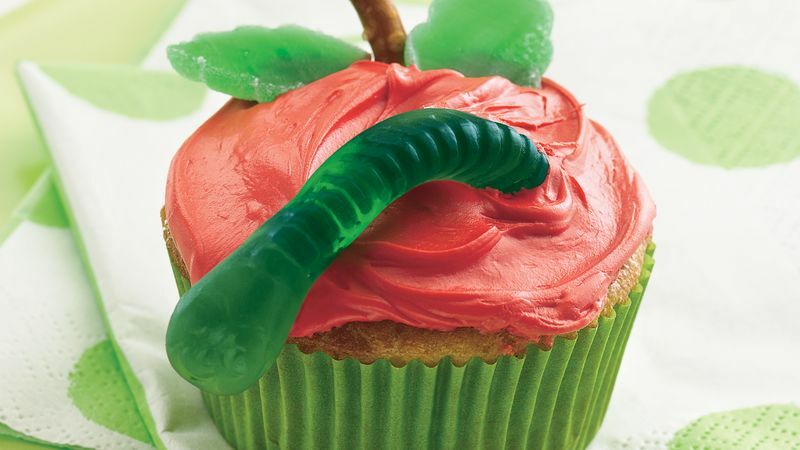 Poke half of gummy worm into each cupcake. Store loosely covered. If you don't have unsweetened applesauce on hand, the regular kind will taste great in these cupcakes, too.